Counting happens every day from late April to early June, 6:00am - 8:00pm. Each sign-up is for a two hour period. Count during any TWO 10 minute blocks within your two hour period. The blocks can be right next to each other or spread out during the two hours. Whatever works for you! Access to the site is along George Wright Road. To get there: From the Woolwich Town Office, turn left and travel to the stop sign at the bottom of the hill. Turn to your right onto George Wright Road, and about 100ft. down the road, before a hill, you will see a dirt road with a gate on your left. The fish ladder is located a short way down this road. 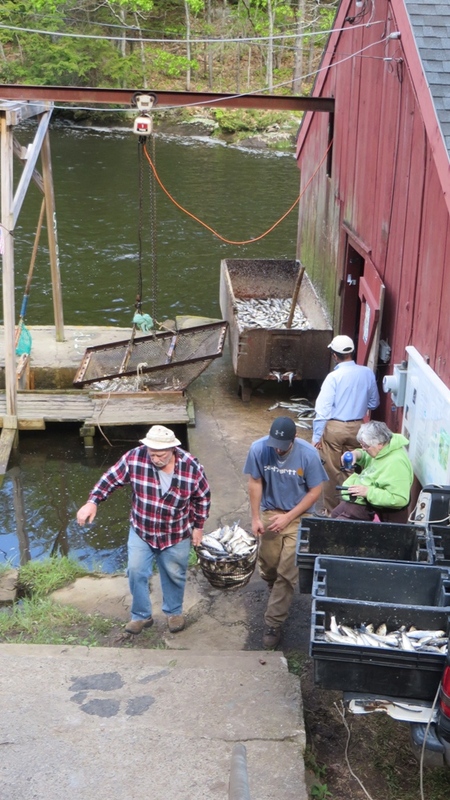 If you are counting on an alewife harvest day (Thursday – Sunday) park along George Wright Road or at the head of the dirt road and walk down to the ladder. PLEASE don’t block the road, or drive down. This is reserved for the harvest crew and bait buyers. 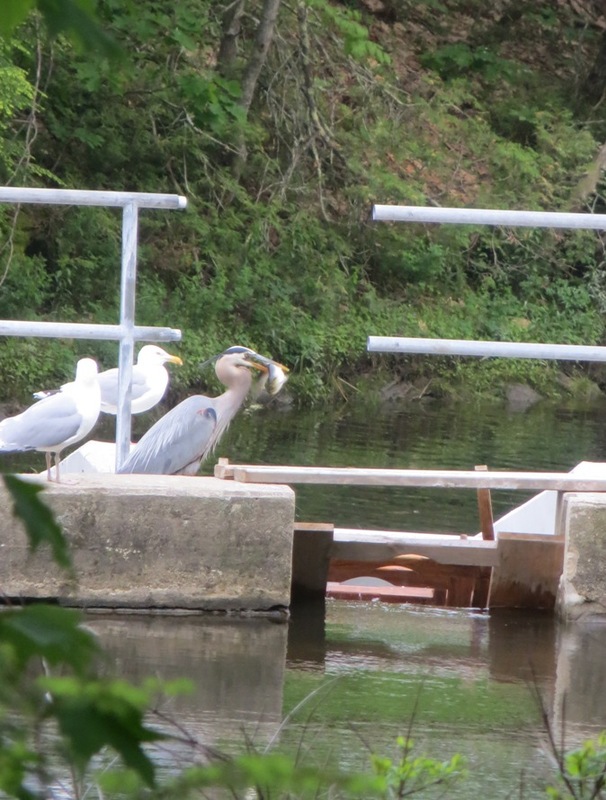 If you are counting on a day when alewives are not harvested (Monday – Wednesday), you can drive down to the dam to park. The equipment you need to count is inside the red fish house. 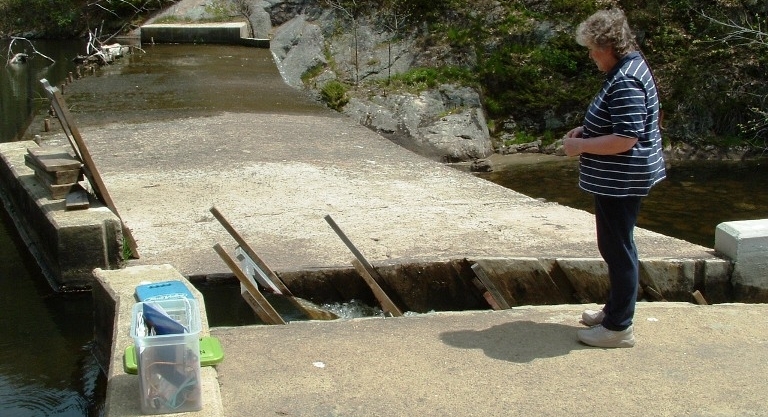 Note: Counting takes place at the final wooden v-notch weir at the top of the ladder. Please count the fish when they completely pass through the final weir and enter into the still water of the lake above. Collect the plastic tub (clear with a green lid) of counting gear from the fish house - the lower building on the water. The tub should be inside, against the wall to your left. Carry tub to the top of the dam. If the surface of the dam is wet, it may be slippery. Please be safe and do not count. Simply record conditions on the data sheet and return materials to the fish house. Read air temperature (F) using the thermometer attached to upper rail of the fence, then read water temperature in Nequasset Lake using the floating thermometer attached to the lower rail of the fence. 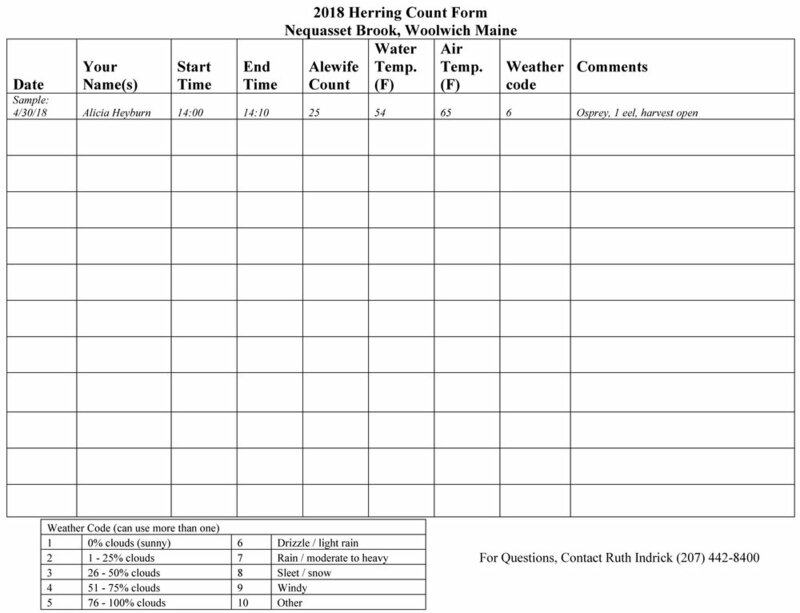 Using the data sheet provided (waterproof paper), write down the water temperature (F), air temperature (F), weather code, and any brief comments about the weather or predators (such as seagulls, seals, etc.). See the observation section on page 2 for more comment suggestions. Find a comfortable position with a good view of the final v-notch weir, just before the dam meets the lake. Check your watch, write down the times you will start and end your 10 minute count (e.g. 14:17-14:27 or 14:55-15:05). Hold the clicker, set the timer for 10 minutes, and…. each time a fish passes over the weir and enters all the way into the still water of Nequasset Lake, click! If you don’t see any fish during a 10-minute count, write down 0 fish. This is important data! A nearby fish ladder tagged fish last year and is tracking where they go this year. If you see a fish with a small blue plastic tag sticking out of its back, please note it in the comments section. When 10 minutes is up, record your data on the data sheet. Put your completed data sheet and other equipment in the plastic tub, and return it to the fish house. Polarized sunglasses will help you see the fish better. Hold the thermometer by the string, so you don't change the temperature with body heat. Remember to zero the counter on the clicker-counter before you start counting! To avoid spooking the fish, stand still, and try not to cast a shadow on the stream. In late May and early June, if you see fish sliding backward down the ladder, these fish are probably exiting the lake. Fish exit the lake tail-first. Please don’t include these fish in your count but do make a note of them on your datasheet. If there is no thermometer, if there is no counter, if you need more recording forms, or there are other problems, please call Ruth at 207-442-8400.